Sneakers by GABOR with "Opti fit" replaceable footbed – suitable for orthopaedic inlays, and "Best fitting" finish. 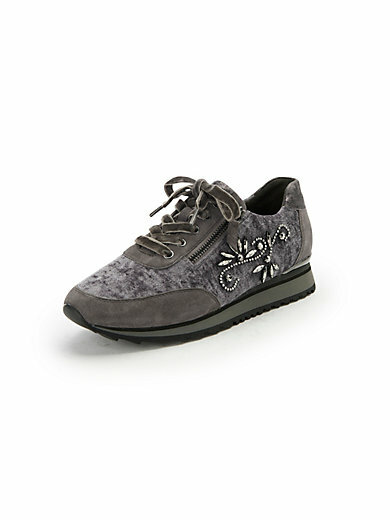 Elaborately constructed in fashionable look with velvet shoelaces, decorative pattern of rhinestones and facetted stones on the side, as well as additional zip fasteners, flanking the lacing. Outer material of the navy version made of kidskin suede leather. Carbon version made of velvet with kidskin suede leather. Leather-­covered footbed and microfibre lining. Latex sole slightly raised on the front. Heel height approx. 1in.